From the Hancock County Courthouse, go east on Hwy 15 (Broad St) for two blocks (0.2 mile) and turn right on Boland St. which becomes Linton Hwy. Travel 13.9 miles (bear right after 8-1/2 miles onto Beulah Highway at the Linton - Beulah Highway split) to Town Creek Rd. Turn right and travel 1.5 miles to a logging road on the left. 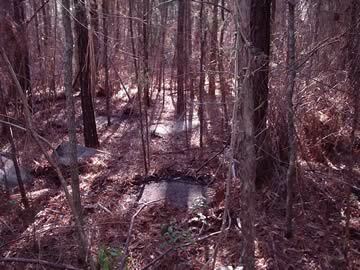 This point is 0.2 mile from the cemetery, which can be found roughly as follows: follow the logging road to a hunting camp, then turn right on an ATV trail once through the hunting camp. Follow the ATV trail for 100 feet and turn left into the woods. The cemetery is on a small hill with a large cedar tree inside the wire enclosure. Enclosed with wire fence and metal gate. On private land. Most of the graves have concrete slabs with handwritten names and dates, which are very difficult to read. An adult slab. While the spelling on the slab is "Acie", the traditional spelling has been "Asa", per Judy Smith, descendant. An adult slab. See note on Acie Simmerson concerning spelling of "Acie". w/o Alfred Brown. An adult slab that is broken into several pieces. "Jarella" has generally been spelled "Jurelia", per Judy Smith, descendant. w/o Charlie Kilgore. First and middle name unreadable. An infant slab. [s/o Bernice and Ruby Osborne Denton] per Glen Cook.